As well as writing extensively about music, I’ve covered many aspects of the arts – books and film in particular. I interviewed William Boyd for his directorial debut on the Battle of the Somme; Roddy Doyle for the second part of his The Last Roundup trilogy, Oh, Play That Thing; Bill Bryson for A Walk In The Woods, his hike along sections of the Appalachian Trail; and popular children’s fantasy-adventure author Eoin Colfer. There were early encounters with Will Self and American crime writer Walter Mosley. Other authors I have profiled include Dervla Murphy, Alexander Stuart and Jenny Diski; I also reviewed books for GQ for several years. 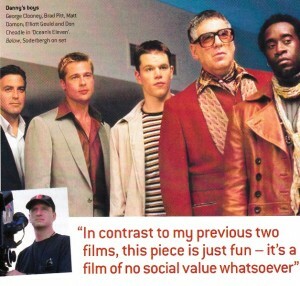 I’ve met some pioneering film directors, such as Mike Leigh, Ken Loach and Steven Soderbergh. 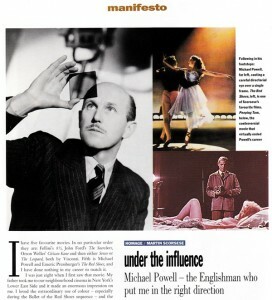 I interviewed Martin Scorsese in Paris about the influence on his work of the English film-making partnership of Michael Powell and Emeric Pressburger; I turned our conversation into a ghost-written homage to the “subversive commercial” duo. 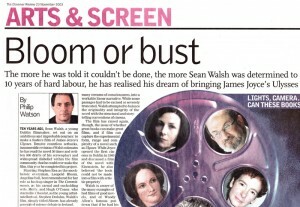 There was also a feature for the Observer on young Dublin director Sean Walsh, who after ten years hard labour, realised his dream to bring James Joyce’s Ulysses to the cinema. While Joyce firmly believed his masterwork “could not be made into a film with artistic propriety”, there is a link back from the novel to the world of film: Joyce opened Ireland’s first cinema, the Volta, in Dublin in 1909.